On September 30, the Russian Aerospace Defense Forces launched an operation in Syria to drastically change the situation there. The action is shifting the tide of Western public opinion. The change of mindset is visible even among the nations tied to the United States by vassal-ally relationship. For instance, the Baltic States. It is an open secret that the United States and NATO see the Baltic countries as their «unsinkable aircraft carrier». Estonia looks more like a large US air force base. Lithuania and Latvia can hardly hide their envy. But opinions calling for new approaches to the issue have been made public recently. For instance, an article published by Neatkarigas Rita Avize, a leading Latvian newspaper, offers a remarkable insight into the underlying causes of the Middle East crisis against the backdrop of events in Syria. The piece says Turkey and Saudi Arabia actively supported power change in Syria, including military assistance. It made them get embroiled in a conflict with no settlement in sight. Anarchy in Iraq and Syria paved the way for emergence of the Islamic State. A complicated scheme was used to make US-made arms get into the militants’ hands, the outlet reports. There are some signs to indicate that the vision of situation is being reviewed in Great Britain. Philippe Sands, a Professor of International Law at University College London, in his article titled We Need a Syria Strategy, not Half-Baked Reasons to Drop Bombs offers a definite conclusion that the government of David Cameron simply has no strategy on Syria. «The UN Security Council has in effect ceased to function on the Syrian question, so there will be no authorization of British bombing from that quarter», the author writes. «Unlike the Russians, who claim that the lawful government of Syria has invited them in – and unlike Iraq, which asked for UK support – in Syria, there is no entity from which Mr Cameron can request a permission slip… Rather than spend more time concocting insubstantial legal justifications for dropping bombs, Mr Cameron should develop a proper policy for addressing the region’s spreading conflicts. Like it or not, he is going to have to engage with all the most important actors in the complex Syria conflict, including Russia and Iran, Turkey and the Kurds, Saudi Arabia and its allies», the author adds. Sands believes that, «Cameron will also have to come to terms with the fact that Mr Assad is likely to play a role in finding that longer-term settlement». The multi-pronged Syrian crisis threatens Europe. Changing attitude towards the asylum seekers that flood the continent is the best example of it. 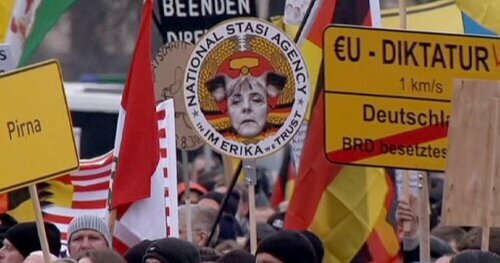 Thousands of PEGIDA (Patriotic Europeans against Western Islamization) members have marched through Dresden (the German federal state of Saxony) demanding resignation of Chancellor Angela Merkel and deportation of all immigrants from the country. One of the posters they held called for Putin to save them – «Mr. Putin, Save Us!» Some of the protesters chanted, «Merkel to Siberia, Putin to Berlin». One protester carried a mock gallows with two hangman’s nooses, marked «Reserved for Angela Merkel» and «Reserved for Sigmar Gabriel», the Chancellor’s deputy. The Dresden’s Sachsische Zeitung reports that 9 thousand of PEGIDA activists and their supporters called for holding a referendum on the independence of Saxony and withdrawal of this German federal state from Germany and the European Union. These protests are the direct outcome of the events in Syria taking place in recent weeks! New winds are blowing. They are obvious not only in media. The ruling elites of the Old Continent are also influenced by the ongoing events. The German and French politicians will never admit they are confused by the strikes delivered by Russian front-line bombers, attack planes and cruise missiles launched from the Caspian Sea to strike the terrorist targets in Syria. But the fact that Angela Merkel and Francois Hollande actually supported Russia at the Normandy Four talks devoted to the compliance with the Minsk Agreement tells a lot (they were anathematized for this by radical nationalists in the Ukraine’s Verkhovna Rada, the Ukraine’s parliament). 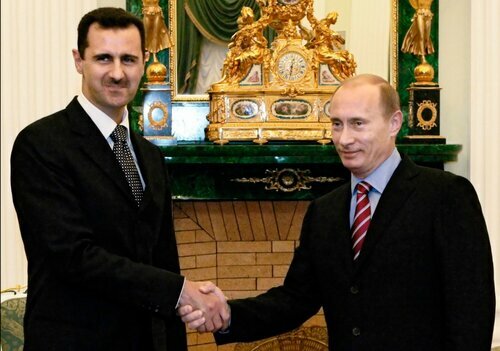 Evidently, Russian self-assertive, transparent and effective policy in Syria has greatly impressed Berlin and Paris. It’s worth to note that Turkish President Recep Tayyip Erdogan suddenly took a decision to double the amount of Russian gas Turkey plans to buy. Initially, in December 2014, the bilateral agreement envisaged to build a four lines pipeline with the annual capacity of 63 billion cubic metres. Due to some difficulties arisen after the agreement was concluded, Russian energy giant Gasprom decided to build only one line with the capacity of 15,75 billion cubic metres. Today Turkey is in talks with Russia on the construction of two lines with the capacity of 32 billion cubic metres stretching to Asia Minor. Alexey Miller, the head of Gasprom, said he hoped the talks on constructing an offshore gas pipeline across the Black Sea towards Turkey would come to the phase of practical implementation soon. According to the famous aphorism by Carl von Clausewitz: "War is the continuation of politics by other means». Limited use of force to strike at geopolitical soft underbelly at the impeccably chosen moment can also change the tide of world politics. That’s exactly what is happening. Slovakian Prime Minister Roberto Fico made a statement saying that his country supported the Russian Aerospace Defense Forces against the terrorists in Syria. His words produced a great effect. Deutsche Wirtschafts Nachrichten even noted that there is a breach in the NATO frontline as Slovakia became the first member of the North Atlantic Alliance to support Moscow on the issue. Actually, Robert Fico did not say anything extraordinary. He just cautiously noted that it does not make any difference who would play the decisive role in the fight against the Islamic State – Russia or the United States. The main thing is to rout the group. The Slovakian Prime Minister put forward a proposal to include Syrian President into the process of crisis management. This initiative signals the shift in the mindset of Western politicians. There is another reason to explain why the Robert Fico’s statement raised such a ballyhoo. The Prime Minister publicly put into doubt the expediency of using terrorists in order to reach the US geopolitical goals and the need to topple the legal Syrian government. The overthrow of Bashar Assad has been an obsessive, irrational objective set in defiance of international law.